Vision Of The Virgin Mary? The Early Show correspondent Tracy Smith went to see what many Catholics say is an apparition of the Virgin Mary. What she found is that sometimes what people get out of these visions doesn't depend on what they're looking at, but what they're looking for. At Milton Hospital outside Boston, people come for healing far greater than any doctor could provide. Believers like Magalie Marcelin say, "It is a miracle! That's what I think." Every evening, hundreds of believers gather outside to pray and to wait and at 5:30, as a blue tarp is removed, they look up. 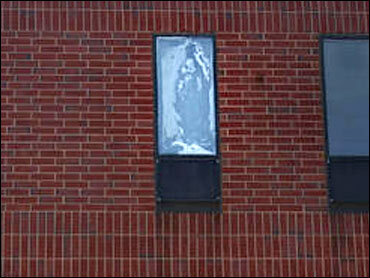 There in a window, at, of all places, the eye clinic, appears what people are saying is a vision of the Virgin Mary. "I see the Blessed Mother," says Jacquelin Reilly. "And I kind of see her holding the rosary. And she's standing on something round, like it's the world." Scott Spencer notes, "The truth is, it's up there and I don't see it on any other windows. I don't see anything else that's strange anywhere else and it's just shocking to me, that's all." But others aren't so impressed. Gesturing as if the image is nothing, Liz Brady says, "It needs to be more pronounced. It needs to be bigger." The Rev. Harvey Egan says, "Not to be irreverent, but I would say is, let's get out the Windex." A Roman Catholic priest, he is a professor of theology at Boston College and notes the church position about visions. "Be skeptical," he says. "You can believe it if you want. You don't have to believe it." Whether it's divine work or just a dirty window is up to your own interpretation. But one thing is clear: tens of thousands of people have come here looking for a message from God. Reilly says, "I think it means that we all should get together more closely and pray." Mary Riordan adds, "Well, look at the mess the world is in financially, physically, morally…"
But this isn't the only time people have looked for signs from above. In 1996, in Clearwater, Fla., another apparition was spotted on the side of an office building and has been there ever since. And more recently, the movie "Bruce Almighty" featured a fictional phone number belonging to God that people actually called. Father Egan explains,"People are thirsty for fulfillment! And I would see the desire to go see the alleged virgin as a manifestation of this, that we're hungry." Tina Polsonetti says, "I think she's gonna perform a miracle before she leaves." And even if it turns out that this is nothing more than condensation on a window, Father Egan says that could still lead to something miraculous. He says, "Supposing somebody went to see the window and came back and drove over to their worst enemy and said, 'I'm sorry.' That to me would be the real miracle." The vision used to be visible all day, but the hospital now covers it for most of the day so the crowds don't interfere with hospital business.